The future of ERP reflects the future of business. As professionals continue to become more mobile, do business in multiple geographies, and put data at the heart of every decision, they’ll expect their ERP solutions to support them. There’s a critical reason why legacy and on-premise systems can’t keep pace. There are occasional periods in history where certain industries must completely reinvent themselves. For example: fax machines, once indispensable for business, are now all but extinct. Windows Servers replaced Novell Networks and cell phones have all but replaced land lines (just try looking for a pay phone these days). Even travel has completely transformed from railway transportation to air transportation in a relatively short amount of time. The key for businesses who want to stay ahead of disruption is to have the foresight to see a paradigm shift before it happens. I heard a speaker say once that if the railroad tycoons of the Industrial Revolution would’ve realized that they were in the transportation business, as opposed to the railroad business, they would rule the world today. Progress always moves forward, sometimes faster than many of us can keep up with. A similar paradigm shift is happening within the ERP space. For the past 30 years, legacy and on-premises systems have dominated the landscape. Unfortunately, the technology that many of these ERP systems were founded on has become obsolete. This technology is now preventing its’ users from taking advantage of the latest and greatest innovations in the ERP space, as that legacy technology is unable to integrate with the new modern technology. We’ve seen users once resistant to switching from mainframes and mini computers to now being adept users of desktop PCs and laptops. We’ve seen accounting centric users, once reluctant to work with anything other than a text-only monitor and an alphanumeric keyboard, demand a graphical user interface (GUI) and a mouse. We’ve seen warehouse management technology such as barcode readers and RFID scanners go from only being available to large, multi-national corporations, to being made affordable and used by the mom-and-pop distributor next door. But That’s All in the Past. What’s the Future of ERP? More recently, with the advent of the Internet and cloud computing applications, we’ve seen a new paradigm shift happening with ERP systems. Users have become more and more familiar and comfortable with using applications on their phones, tablets, and browsers on their laptops. 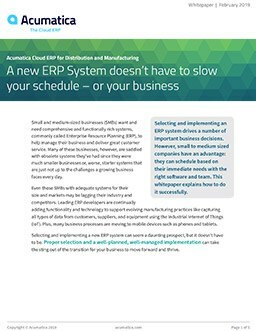 They now expect and demand that same ease-of-use and flexibility from their ERP systems. We’ve seen the demand from end-users to have workflow engines, or intelligent software that can proactively determine a process or notify users when an exception occurs. Our clients want simple to use, configurable dashboards, that give them one click to key, relevant information. Our clients demand business intelligence (BI) solutions that allow them to analyze their sales and financial data from a variety of different perspectives. Due to our ever-shrinking world, and ever expanding global economy, our clients demand international solutions that can manage multiple currencies, as well as multiple legislations and physical requirements. This allows them to have subsidiaries and partnerships around the world, and have all their users on a single, fully integrated platform. All of this represents the new norm, and the new paradigm shift in the ERP industry. Unfortunately, many legacy and on-premises systems cannot take advantage of these new trends because the platforms and language they were originally written in simply do not support them. As a reseller, Southeast Computer Solutions considered all of these issues carefully before making the decision to get certified in Acumatica, the only true Cloud ERP. Acumatica designed its ERP platform to provide all the power inherent in the older legacy and on-premises systems, with the added benefit of a modern, user-friendly platform that can take advantage of these newer requirements coming from our user base. The added benefit for our customer base is that many of the third-party add-ons we’ve sold for the past 30 years are compatible with Acumatica. We’ve seen the future, and for us, it’s Acumatica. Senior Vice President, Sales and Marketing at Southeast Computer Solutions. Ralph joined the ERP software industry in 1992 as a software programmer. He came on board at Southeast Computer Solutions in 2002 and now serves as “second in command” and focuses primarily on the sales and marketing business units. Ralph prides himself on his unique ability to assist customers in growing their organizations by leveraging new technologies to meet and exceed their business needs. What Benefits Does a SaaS Cloud ERP Platform Provide to SMBs? Acumatica provided a consolidation solution that reduced the time and cost of producing and distributing reports by 80%.